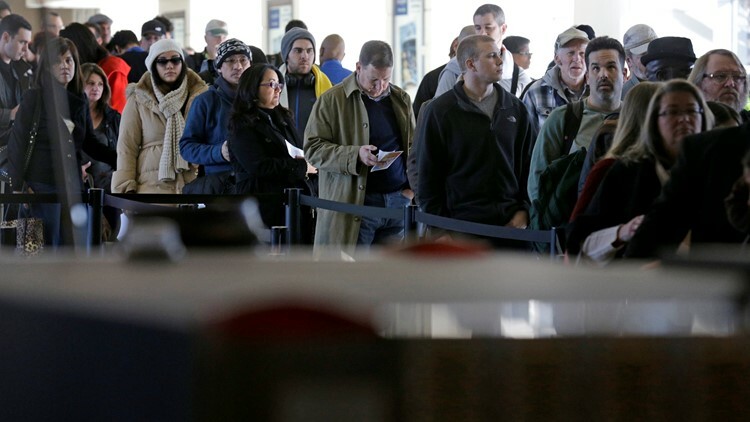 Travelers wait in line to check in on Nov. 21, 2014, at a security checkpoints area at Midway International Airport in Chicago. An llinois resident with a now-confirmed diagnosis of measles was on a flight that arrived at the airport. CHICAGO — Travelers passing through Chicago Midway International Airport may have been exposed to measles last week, the Illinois Department of Public Health announced. The department said Thursday an Illinois resident with a now-confirmed diagnosis of measles was on a flight that arrived on Feb. 22 in Concourse B at Midway. The passenger was not vaccinated and infectious, according to the department. Authorities believe people may have been exposed to measles if they were at the airport between 9 p.m. and midnight on Feb. 22. Most people are vaccinated for the disease in childhood. People who are not vaccinated have a higher risk of catching measles. The Centers for Disease Control and Prevention said widespread use of measles vaccine resulted in a 99 percent reduction in measles cases compared to the pre-vaccine era. Note: The Associated Press contributed to this story.